Dec 28, 2016 in "Epcot International Festival of the Arts"
The 2017 Epcot International Festival of the Arts gets underway on January 13, offering 6 weekends of special entertainment and experiences. Disney will be offering premium experiences, and bookings are now open, including a 15% discount for Annual Passholders and DVC Members with select experiences. You can book now by calling 407-WDW-PLAY. 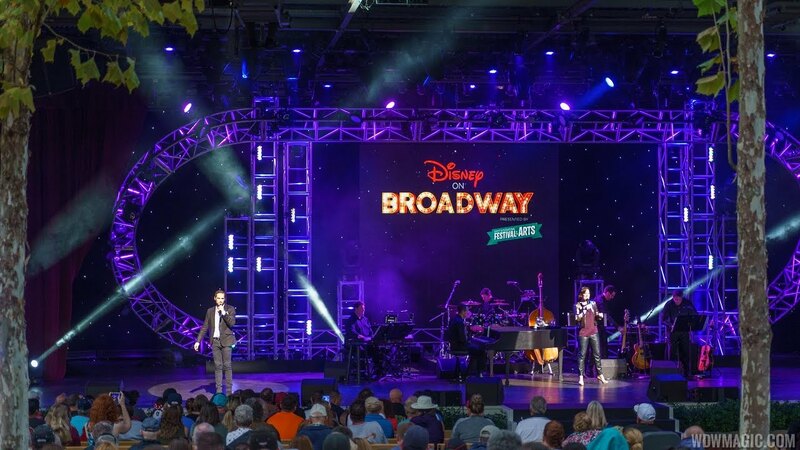 The concert series will pair Broadway talent with favorite songs from award-winning Disney shows such as “The Lion King,” “Newsies” and “Aladdin”. The Dining package includes a three-course meal or full buffet and priority seating at the 8:00pm concert at participating Epcot restaurants. Prices range from $39-$69+ tax for adults, $23-$41+tax for children. Workshops include gesture drawing class, watercolor painting, mixed media art, calligraphy and floral arrangements. The Interactive Workshops are $39+tax each Friday-Monday of the Festival. All workshops wil be held in the Odyssey Festival Showplace. Create a magnificent mixed media piece using BoiLeD BooK paper and paint. We'll finish it off with a mat and some sparkle for a magical masterpiece to display! “Story Telling Drawings:” Come learn the art of quick sketching from life with a Disney animator. Gesture drawing of people is foundational practice for animators, story board artists, and directors. A single drawing can tell a story. Imagine the Pixie-dusted possibilities as the Disney Floral Designers show you how to make a little floral design magic! In this session we will teach you the basic floral design principles and show you how to create a petite Tinker Bell inspired floral arrangement – all it takes is faith, trust, and a little pixie dust! Macramé is the art of knotting rope to make patterns. In this class you will learn basic macramé knots and how to make a modern wall hanging. Fun for the whole family! 11:00 AM Floral Arranging with a Disney Floral & Gifts DesignerMickey Mouse is in the house! Let the Disney Floral Designers show you some of our favorite ways to add a little touch of Mickey-magic to any floral arrangement. During this session, we will share basic floral design principles along with some Disney inspirations to help you bring the magic of Disney home at any time of the year! Paint a wonderful work of art blending watercolors to create a beautiful sentiment. A choice of shapes will be available for your selection. We'll finish it off with a mat and your watercolor art will be quite a delight! Learn how to blend spices the P.S. Flavor! way and become a top chef in your own kitchen! You will be mixing a P.S. Flavor! spice blend to your own tastes and using it to create a vibrant vinaigrette and sensational salad... flavor from start to finish! Come learn the artistry behind the decorating techniques of Amorette’s signature “petite cake.” We will cover how to buttercream and decorate a cake while discovering the unique artistic touches of Amorette’s Patisserie. In the end, you will have a one of a kind cake designed to honor Epcot! Learn to roll and decorate your own truffles using the Signature Ganachery Chocolate and pick up a few tips and tricks from the talented team of Chocolatiers! Learn about the history of 2D Cel Animation and paint your very own Ink & Paint Cel! Learn from a top mixologist as you experience a hands-on cocktail making workshop! Elevate classic cocktails by adding your own artistic touch and transform the simple cocktail to elegant using craft ingredients. Create your own animated Flip Book while learning the fundamental Principles of Animation with a Disney animator. Watch your drawings come to life! Make a beautiful handmade love note for Valentine’s or anytime. You will learn to make your own origami heart card and envelope. Then you will learn how to hand letter the greeting. Make with your hands and give from your heart. Learn the basics of pointed pen calligraphy and work on a special project in class together. We will cover topics such as mastering faux calligraphy, how to hold your oblique pen, letter formation, common issues you may run into, and which paths you can take with your new skill! Just like an artist creates a painting, you will create your own aromatic tea blend. In this fun and interactive workshop, we’ll discuss what tea is, the basics of blending, then set you free to blend your own tea using herbs and botanicals. When you finish your creation, you will take it home with you! Nothing is more personal than typography created by hand. It conveys time and thought lovingly invested into the art form of a word. Learn how to draw your own hand drawn typography to create personalized gifts and cards. Learn how to blend spices the P.S. Flavor!TM way and become a top chef in your own kitchen! You will be mixing a P.S. Flavor!TM spice blend to your own tastes and then using it to create delicious dips and smoky spreads... flavor from start to finish! Join us for a demonstration and tasting of recipes using The Olive Pantry's gourmet olive oils and balsamic vinegars. Learn how to incorporate Ultra Premium certified extra virgin olive oils and balsamic vinegars to make your own home cooked meals healthy and delicious. Discover the craft of jewelry making and create your own beaded cuff bracelet using wire and crystal beads. Leave the workshop with your unique piece of jewelry and a new talent! During this session, the Disney Floral Designers will show you how to create a Valentine inspired arrangement. We will teach you basic floral design principles, tips and techniques so you can recreate the magic at home at any time of the year. Share the love with someone special or keep this one for yourself! Enjoy a fun creative journey through self-expression to reveal your unique Artistic voice. Bring your abstract art to life as you paint a one of a kind Masterpiece!